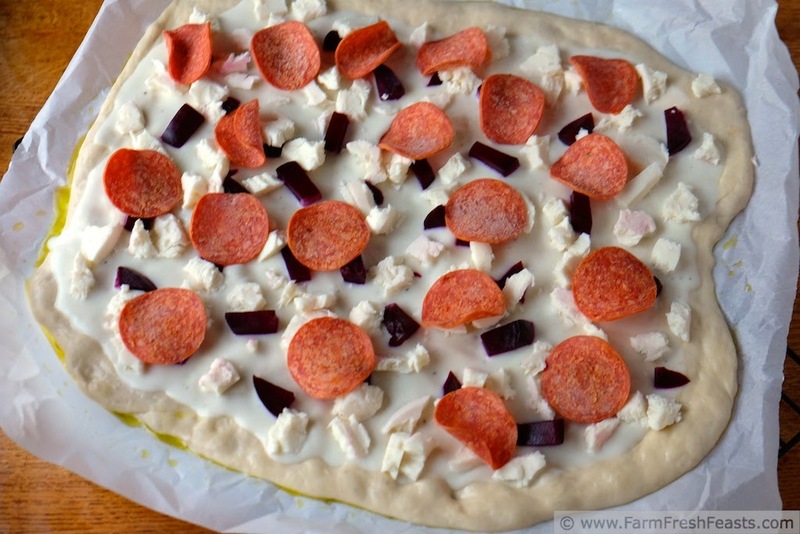 Roasted beets nestled between shreds of fresh mozzarella and gorgonzola on a béchamel sauce bed, then topped with spicy pepperoni or salty ham. Once baked, scatter fresh arugula across and serve. 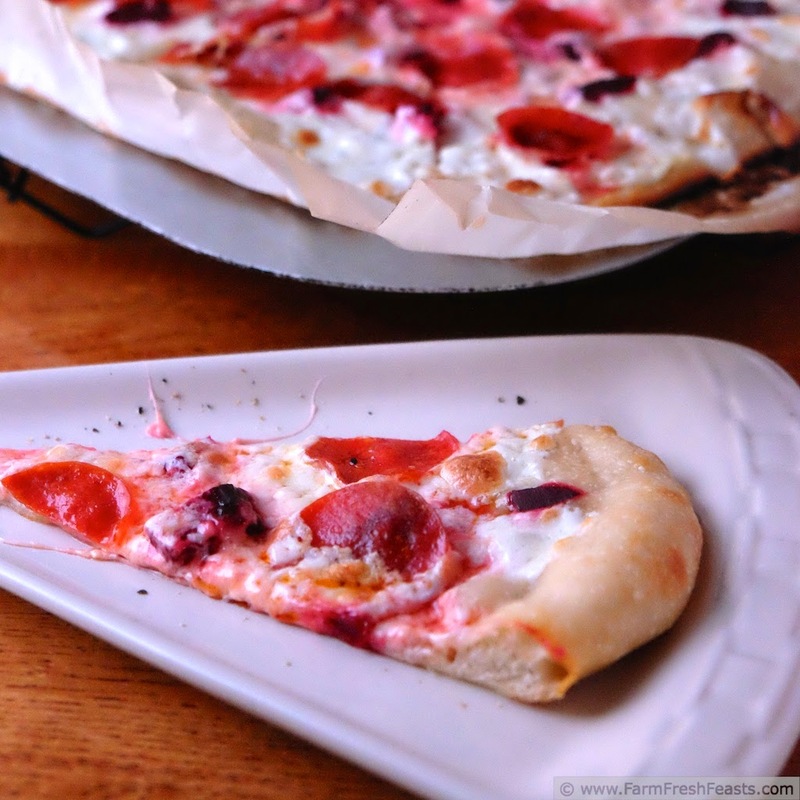 It's been a while since I've shared a pizza recipe. I've been creating pizzas nearly every weekend, because my housemates have, ahem, Expectations, but I'm not always taking photos and jotting down recipe notes. 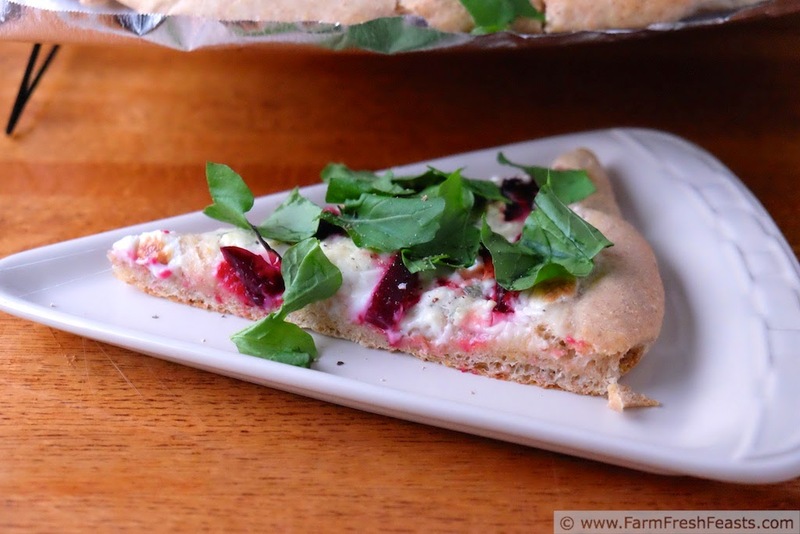 This recent pizza, using beets and arugula from our Community Supported Agriculture (CSA) farm share, looked interesting enough to snap a few photos. Have you ever been to a book signing? I sorta went to one recently. In fact, I accompanied my spouse to the signing of an author he enjoys--John Scalzi. The signing was at an independent bookstore and I happily curled up in the cookbook section--after reading all about becoming Amish in a survivalist magazine! I'm always up for a trip to the bookstore--I can entertain myself for hours and I always learn something new. While reading I had half an ear listening to the author's presentation, and this guy is good. He read some excerpts from . . . [something, I dunno, it could have been his newest book or could have been his collected works--like I said I was listening with half an ear] and in between excerpts he'd give a general overview of how the signing would proceed for the ever-growing audience "tell 'em what you're gonna tell 'em, tell 'em, tell 'em what you told 'em" style. His reading style was expressive, confident, and relaxed. During the Q&A he was both thoughtful and funny. Even though my spouse had a Kindle copy of the newest book, he picked up a copy to donate to our library. While I was enjoying this presentation-by-an-author-I'd-never-read**, I was also flipping through cookbooks and gathering inspiration. One pizza cookbook (from a restaurant in NYC with a celebrity chef and a catchy title that I cannot find on Amazon) had a section on basic pizza sauces to have on hand. The list included tomato, pesto, and béchamel. Béchamel . . . hmm. I'd just been reading about sauces in Melt: The Art of Macaroni and Cheese (Amazon affiliate link) since I've had a terrific hankering for mac and cheese this Fall. It is just butter, flour, and warm milk--I can make that. Heck, I've been making it and calling it a Basic White Sauce, out of my 1950 Betty Crocker Picture Cookbook (like I did in my Creamed Swiss Chard with Back Bacon here)! I thought to myself 'Self, why have I never put a basic white sauce on a pizza before?'. After I read that béchamel sauce keeps for a few days, I figured I could play around with it and here we are. 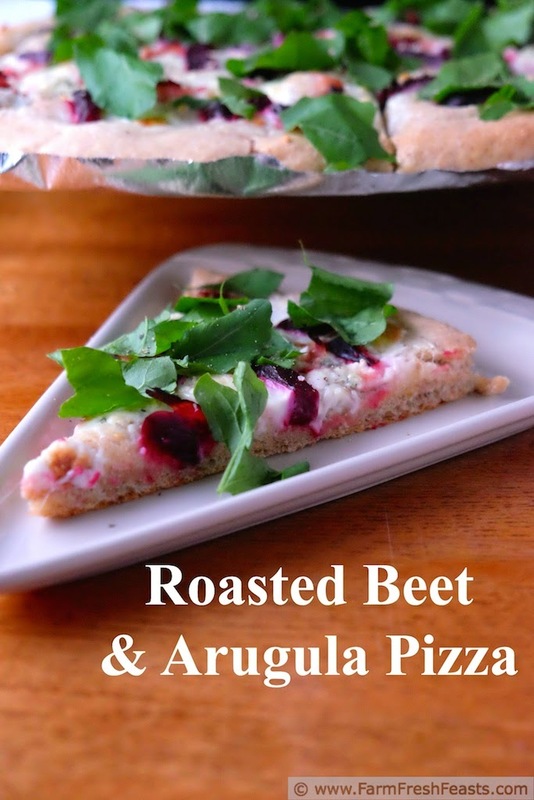 I've updated my Visual Recipe Index--for more recipes using beets, look here. For more recipes using arugula, look here. 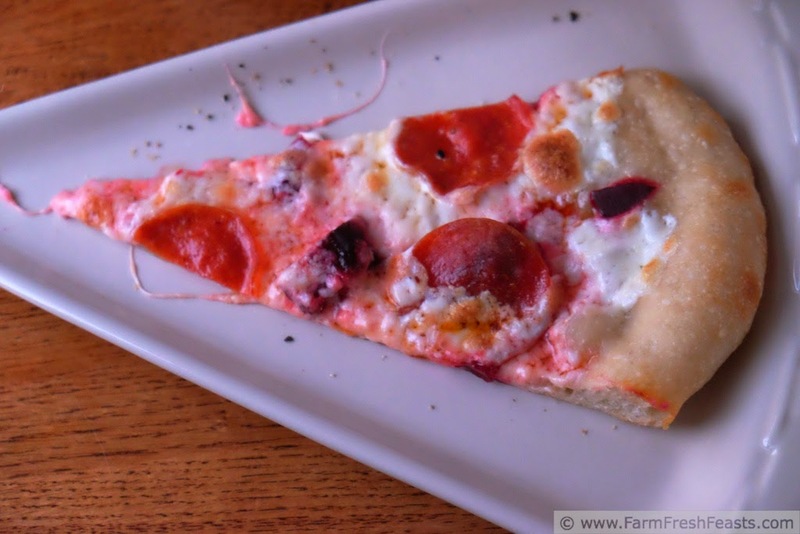 For a photo-filled tutorial on making pizza at home, please check out my Pizza Primer. Melt the butter in a large saucepan over medium heat. Stir in flour and cook until lightly browned. Pour in hot milk in small amounts, stirring or whisking in between each addition. It will get smooth again! Once all the milk is added, add salt and pepper then cook and stir a few more minutes until thickened. Set aside. This makes 4 cups and keeps for a few days in the fridge. When you're ready to bake the pizza, preheat the oven to 450 degrees Fahrenheit. 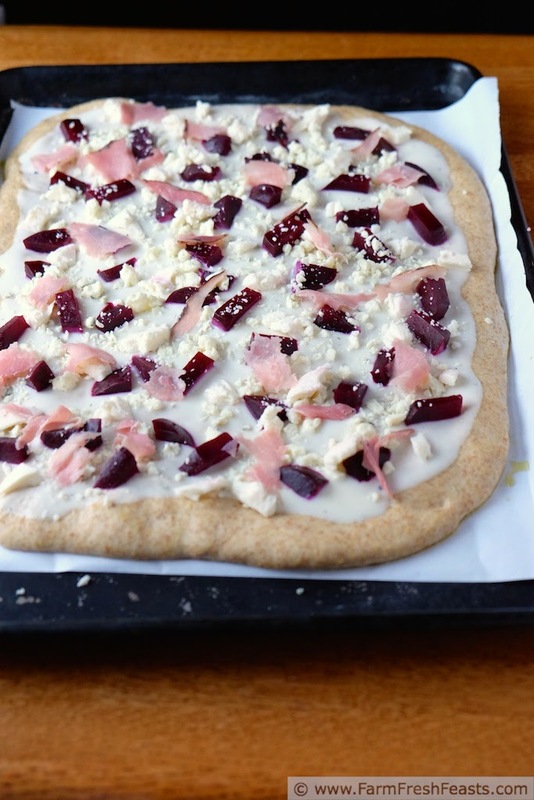 If you've got a pizza stone--hooray!--have it preheat in the oven as well, otherwise just use a cookie sheet. Stretch out dough on an oiled piece of parchment paper, and spread with white sauce. 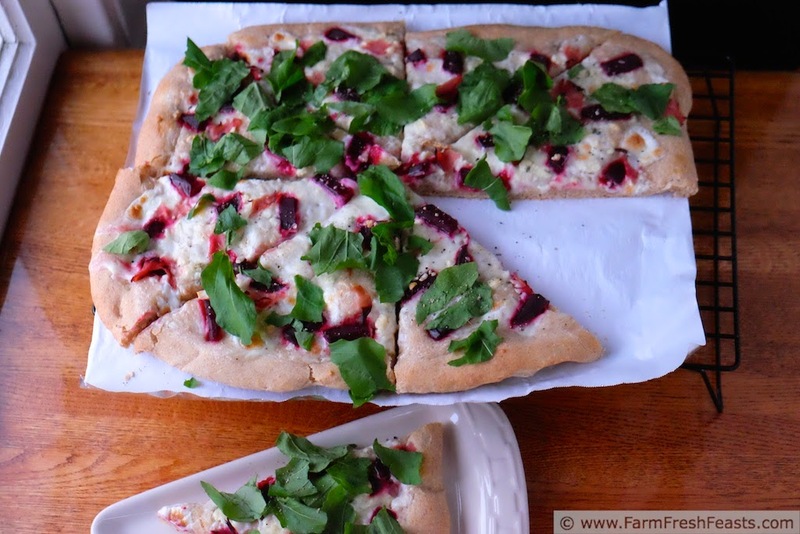 Top with chunks of roasted beets, mozzarella, and gorgonzola. If meat's your thing, add some pepperoni because it tastes pretty good here. Bake, on the parchment paper, for 5 to 8 minutes. Shimmy the pizza off the parchment and bake directly on a stone or cookie sheet until the cheese is bubbly and browned, another 3 to 5 minutes. Remove from oven, top with arugula and freshly cracked pepper. Serve. **I've now read some of John Scalzi's work. I started with Unlocked, enjoyed it, and will read Lock In after I finish The Invention of Wings for book group next week. White sauce on a pizza, I'm fascinated. It makes sense though. What a great combination. It does make sense. Like peanut butter and chocolate. Or beets and mimosas. The pizzas look wonderful, I love white sauce on pizza!! I feel so behind the times to not have had white sauce on pizza. Better late than never.